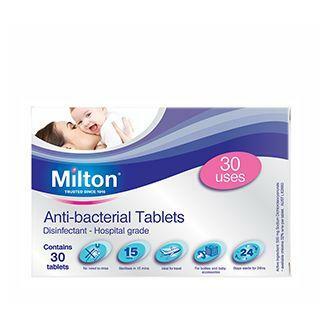 Milton Anti-bacterial solution is used in hospitals and homes for generations to sterilise surfaces and baby items. No boiling or steaming, no risk of burns, Clinically proven. Trusted since 1916, Milton Antibacterial Solution is the tried and tested way to protect your baby from harmful germs in the early years. Where to use Milton Anti-bacterial Solution? Using Milton Sterilising Tablets means it takes just 15 minutes to sterilise feeding equipment. No. The Milton solution leaves no unpleasant taste or odour, so there is no need to rinse after use - utensils can be used immediately. 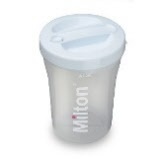 Add 2 Milton Tablets per 4 litres of clean cold water into the Milton Method bucket (or a plastic container). After squirting made-up solution through the teat holes, completely immerse all items, covering items with the white submerger plate (or a china plate) to eliminate air bubbles. Secure the lid. Designed to sterilize a single baby’s bottle using a microwave or Milton cold water method. Ideal for travel, overnight stays or when you’re away from home.